Sirens, flashing lights and helicopter rotors broke the serenity of Shaikh Zayed Grand Mosque on Monday evening in the capital. As the mosque’s white domes shone in the golden light of the setting sun, the convoy of the Catholic Church pulled up outside the UAE’s largest house of worship a little after 5pm. Amid a cavalcade of 4x4 unmarked blacked out police patrols, with red and blue lights flickering, emerged the pontiff’s humble black Kia Soul, detailed by suited Swiss Guards running either side as it glided over the marbled slabs, before pulling to a standstill outside the mosque and in front of the world’s waiting media. 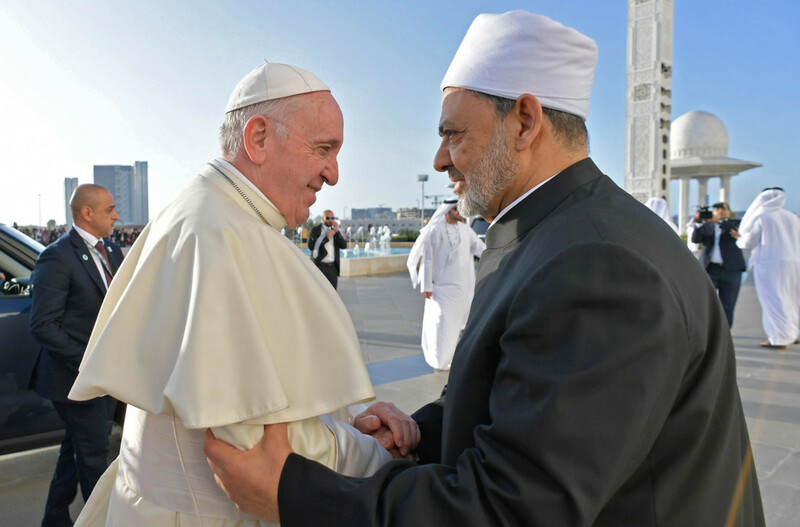 Here, Pope Francis took tender steps, aided gingerly by a Vatican aide as he stepped out of the vehicle to greet Grand Imam of Al Azhar, Ahmad Al Tayyeb, an Egyptian cleric, who is regarded as the world’s highest authority in Sunni Islam. The heads of two of the world’s most followed religions then stood gazing at one another with nothing but respect and affection, arms outstretched for handshakes and greetings, before posing for a picture in front of the press as high walls of one of the world’s most famous mosques towered in the background. Inside the mosque, the pontiff held a private meeting with Al Tayyeb and other scholars. Silent now, but for a helicopter overhead and the swirling of an early February breeze, which swept at the pontiff’s robes, the pair made small steps into the mosque through a side door. These steps will ultimately be viewed as symbolic strides not just towards peaceful coexistence and greater religious harmony and understanding within the UAE, but also far beyond its borders. Such beliefs were installed by the UAE’s Founding Father Shaikh Zayed Bin Sultan Al Nahyan — whose final resting place is located on the ground adjacent to the complex — making Shaikh Zayed Grand Mosque the ultimate venue for such a symbolic occasion in this historic visit — the first by a pontiff to the Arabian Peninsula. Completed in 2007 after taking over 10 years to build, the chalk white structure glistened in the early evening sunset as Pope Francis and the Grand Imam began their tour — a visit held privately and out of view of the gaze of press. Mohammad Jalal Al Raisi, Executive Director of WAM, told Gulf News: “This visit gives a lot of messages to the world. Shaikh Zayed Grand Mosque symbolises the UAE’s cultural and religious heritage as well as its well-practiced values of tolerance and harmony. “People across the world irrespective of their faith are welcomed here everyday. “When a top Christian leader visits there it’s recognition of those values. “This visit once again recognised the UAE’s global reputation as a country standing for tolerance, fraternity and harmony,” he added. Having come to the mosque fresh from a visit to the Presidential Palace in the morning and ahead of a interreligious meeting at the Founders Memorial that night, Pope Francis wrapped up a memorable first full day in the emirates ahead of what will surely be the highlight of his trip — Tuesday’s Mass at Zayed Sports City, which is expected to be attended by over 135,000 worshippers.